Do you or someone you know often ask, "What day is it?" A handy desktop calendar keeps everyone on track and looks great on anyone's desk. 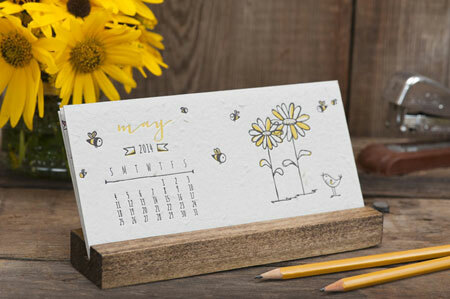 We love these non-personalized desktop calendars by Stacy Claire Boyd. Stock up on them for the holidays and have them on hand to give as last minute gifts. They're great for a hostess gift or stocking stuffers for the organized family member. The calendar and pages come with an easel for your desk and the package is just $40.00 (refill pages are $22.00 per set.) The trendy background patterns look great all year round and make a bold statement on your desk. You can also check out the other great desktop calendars by Stacy Claire Boyd and others here. More Than Paper has recently added a bunch of very cool desktop calendars. We also love this one which is letterpressed (a classic technique in paper that is very trendy right now!) When the month is over, don't throw them out, this one can be torn up and planted in the ground. Daises will sprout! This is a wonderful eco-friendly gift that everyone is sure to love. See all of our desktop calendars and choose your favorite here!